Chennai is now the global hub for Nilpeter’s FB series which is being exported to North America, Europe, Asia and Africa. The Danish printing press manufacturer opened a new manufacturing and development facility recently in Chennai. It may be recalled that the FB series is currently manufactured only in India, as production in the US was discontinued in 2017. Earlier, the FB series was manufactured both in the US and India. “And this also means that we are exporting various parts of the machines – that we are billing in India – to Europe, America, Latin America, South East Asia and Africa. So, we have more than doubled our capacity in Chennai but we still need more capacity,” added sales and marketing director of Nilpeter, Jakob Landberg, after Barretto. In fact, the land area at Nilpeter’s new center has space for additional expansion over time. 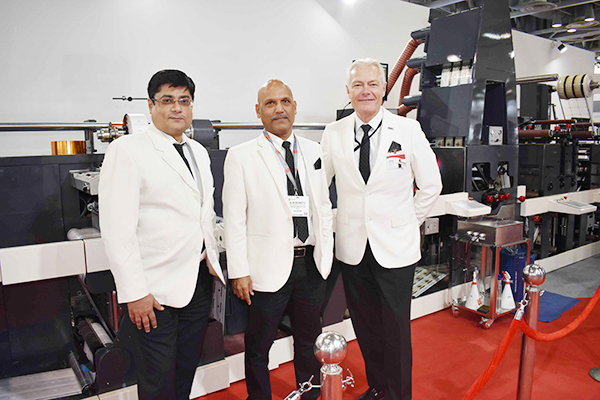 An FB series press rolled out from Nilpeter’s new expanded factory received great appreciation when it was displayed for the first time at the recently concluded Labelexpo India 2018 exhibition in Greater Noida. It was in fact one of the showstoppers of the event with lots of people crowding the Nilpeter stand all through the exhibition days. “The press displayed at the Labelexpo India event was the new generation FB 350 with new frame and structure with increased automation over the old FB 3300. We have introduced two new features on this press: the flatbed foiling system FP-4, a product made in Denmark, incorporated within the flexo units; and end-of-the-line automation,” explained Barretto.